Seven months, 1,415 submitted ideas and 14 painting days after the start of the Belgian Icon contest, Brussels Airlines’ fifth iconic plane is ready to carry out its Belgian colours around Europe and beyond. 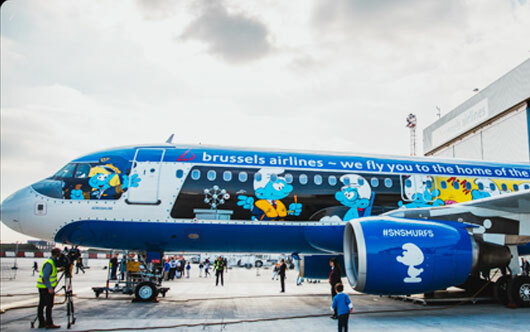 The Smurfs design by the Italian Marta Mascellani, chosen by the public, will represent Belgium on a Brussels Airlines A320 named Aerosmurf. The Smurfs, who celebrate their 60th birthday this year, are one of Belgium’s most loved comic characters and are sure to be the perfect flying ambassadors for Belgium.